Kaspersky Internet Security is a complete Internet security software suite which provides high-level protection for PCs against a wide range of digital threats. Delivering the latest advanced tools and cutting-edge technologies, Kaspersky Internet Security ensures a risc-free computing environment, protecting PCs against all kinds of threats such as viruses, Trojans, spam, hackers and many more. KIS contains all the means to protect your PC against viruses, Trojans and worms, spyware and adware with built-in scanning functions in both real time and on demand for files, e-mails, Internet traffic, instant messengers and also Java and Visual Basic Scripts. Not even unknown threats are a problem, thanks to the KIS proactive protection. Kaspersky Internet Security ensures you have a worry-free Internet experience, extending your protection to the next level with a two-way personal firewall, safe Wi-Fi and VPN connections, an intrusion prevention system, intelligent management and control of applications, automatically configured application rules, security ratings for unknown applications and restricted access to your resources and data for unknown applications. Kaspersky Internet Security also offers preventive protection for your PC by scanning your operating system and installed applications for vulnerabilities, analyzing and closing Internet Explorer vulnerabilities, disabling links to malware sites, detecting viruses based on the packers used to compress code and monitoring global threats through the Kaspersky Security Network. 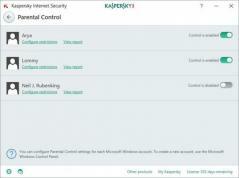 If your computer has already been infected, Kaspersky Internet Security can still be installed and used to clean your system and restore correct system settings after removing malicious software. It also has self-protection enabled to prevent attempts from disabling or stopping it. If you need a rescue disk, KIS provides the tools needed to create it. Kaspersky Internet Security keeps your private data…private, with built-in protection tools and technologies that can disable links to fake (phishing) websites, block all types of keyloggers, provide you with a virtual keyboard for safely entering logins and passwords, prevent theft of data exchanged through secure connections such as HTPPS and SSL, block unauthorized dial-up connections and clean up user activity traces such as temporary files and cookies. You can fully control your children’s PC access with the built-in “Parental control” tools that will allow you to choose which applications and websites they use, who they communicate with via social networks and Instant Messaging and what their messages contain using predefined rules. Kaspersky Internet Security also features anti-spam protection for a variety of popular e-mail clients (plugins for Microsoft Outlook, Microsoft Outlook Express, The Bat!, Thunderbird), and blocks webpage banners. Kaspersky Internet Security ensures ease-of-use for all PC users providing: automatic configuration during installation, wizards for common tasks, visual reports with charts and diagrams, alerts with all necessary information for proper user decisions, automatic or interactive mode, 24/24 technical support and automatic database updates.